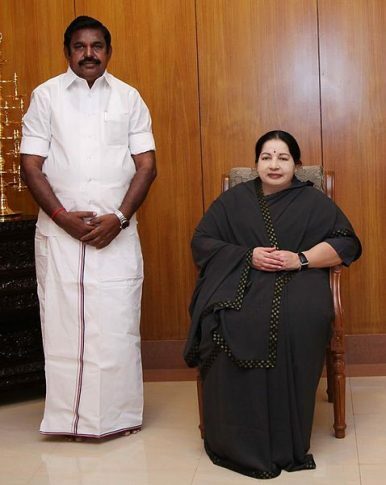 K. Palanisamy with former Chief Minister of Tamil Nadu J Jayalalithaa. The weeks following J Jayalalithaa’s death have seen a dramatic factional power struggle play out in Tamil Nadu. On February 16, Edappadi K Palanisamy, a member of the legislative assembly (MLA), was sworn in as the chief minister of the Indian state of Tamil Nadu. Since the death of former Chief Minister J Jayalalithaa on December 5, 2016, after a prolonged hospitalization, the state has seen a mourning period laced with fear and uncertainty, climactic disaster in the form of Cyclone Vardah, mass protests over the ban on the ritual festival Jallikattu, and a massive oil spill whose cleanup operations have not entirely wound up yet. At the outset, the presence of a new chief minister may indicate an upcoming spate of stability for Tamil Nadu – but the exercise in political theater that February has hitherto been that the power struggle and the resultant drama may not have truly ended. On December 31, 2016, VK Sasikala gave her first public speech after taking over the reins as general secretary of the All India Anna Dravida Munnetra Kazhagam (AIADMK) party, which is currently in power in Tamil Nadu. She had been a close aide of former Chief Minister Jayalalithaa, who had on multiple occasions referred to her as a close friend and an important source of domestic support. While Sasikala’s presence itself had been important in securing Jayalalithaa particular vote banks, her affiliation with criminal groups (nicknamed the “Mannargudi Mafia”) and her role in the corruption case regarding disproportionate assets made this relationship a complex one. In the weeks after Jayalalithaa’s death, as the state moved into mourning, Sasikala’s presence grew more prominent. She performed the late chief minister’s last rights in the highly publicized funeral proceedings and was seen receiving condolences from all the dignitaries who came to pay their respects. By her side was Jayalalithaa’s estranged nephew Deepak Jayakumar. Later, in the media tributes as well as state tributes that were released, Sasikala’s presence suddenly became more distinct. Familiar tributary images and videos suddenly seemed to be lush with her imagery – often in the background, typically understated, but no longer one that could be ignored. While O Panneerselvam temporarily took over the duties of chief minister, it was Sasikala’s power that seemed to grow by the day. She moved from the background to the foreground and a significant portion of the party cadres renamed her “Chinnamma” or younger mother after Jayalalithaa’s own moniker of “Amma” or mother – indicating that she was the destined heir. At every instance, Sasikala tied her moves back to the legacy left behind by Jayalalithaa, always reminding the party and the state that she intended to follow the footsteps of their departed leader. In the meanwhile, some members of the party who were uncertain of or unhappy with this rise congregated under Jayalalithaa’s niece, Deepa Jayakumar. She underwent her own transformation – donning similar clothes and makeup to evoke a resemblance to her aunt. While it remained uncertain how much power she held within the party, Deepa’s slowly growing support base was an important indicator that the way forward for party leadership was not smooth. In early February, the scuffle for leadership properly began. On February 7, O Pannerselvam, who had taken over for Jayalalithaa in the past and was a strong loyalist, took a curious trip to her memorial at Marina Beach and sat down to meditate. This caught the attention of the media, who suspected dissent within the party. In the ensuing press conference, he declared that he had been forced to resign by VK Sasikala. He claimed that there was a bid to push her forward as the chief ministerial candidate and that his own “good work” had been cast aside. He accused elements within the party of engineering this transition while he and his team had been putting out other fires like the cyclone and the oil spill. He also claimed to have significant support within the party. Rushing to assuage rumors of a split in the party, AIADMK members close to Sasikala were quick to insinuate that Pannerselvam was in league with the rival Dravida Munnetra Kazhagam (DMK) party, which would stand to benefit from a schism. Sasikala’s response to Pannerselvam’s revelation and challenge was to call him out as a traitor and make a similar allegation about the DMK. She once more reiterated that the party was with her. Both placed requests before the state’s governor to be given a chance to prove their respective positions of power. The situation escalated over the next few days. Panneerselvam’s supporters accused Sasikala of having conspired to kill Jayalalithaa. Sasikala stood by her own conspiracy theory and began to liken her situation to Jayalalithaa’s during the struggle for power that the party faced when former leader MG Ramachandran died. Finally, as the governor took his time making a decision, Sasikala and her team took a large group of MLAs to resorts on the outskirts of Chennai, and rumors emerged that some of them were held there against their will, as a show of strength by the Sasikala camp. Strange incidents like the attempts of MLAs to scale walls or disguise themselves, to supposedly escape this camp, also came to light as the state moved toward a sense of rudderlessness. Accusations continued to fly between camps and suddenly, on February 14, the Supreme Court released the verdict on the Disproportionate Assets case against Jayalalithaa and her team. Sasikala was convicted under the ruling and sentenced to prison for four years. She also faced a fine of almost $1.5 million and a ten-year disbarment from politics. The day was one of chaos for Tamil Nadu politics as MLAs oscillated between camps throughout the day and police gathered outside the Golden Bay resort to arrest Sasikala. A meeting inside the resort was the site of furious debate over who would take over, with prominent names like Deepak Jayakumar being fielded. Paneerselvam was sacked from the higher rungs of the party along the way and banned from visiting the MLAs at the resort, presumably to seek support. Deepa Jayakumar joined his faction as they once more headed to the Jayalalithaa memorial to pay their respects. Deepa then announced her decision to foray into politics officially and lauded the verdict. The Sasikala camp decried the verdict, calling it a slander upon Jayalalithaa’s name. Several hours later, party leader Edappadi K Palanisamy’s name was put forward as the next in command, and he went to seek an audience with the governor. O Panneerselvam and he both once more put forward a plea to prove their respective strength within the party. While Palanisanmy submitted his list of 124 legislators and was ultimately sworn in, O Pannerselvam has declared his decision to fight for justice, accusing the Sasikala faction of holding members hostage to secure their support. Sasikala, in the meantime, was taken into custody after she made a speech swearing loyalty to the party and paying respects to Jayalalithaa. Palanisamy needs to face a vote of confidence over the next couple of weeks to secure his position and that of the faction. The weeks to come are likely to be just as confusing for Tamil Nadu as the past few weeks have been, with MLAs being put on the spot ahead of the floor text. Several important questions remain unanswered. What is the future of Panneerselvam’s alliance with Deepa and how much support within the party does he actually command? Will there indeed be a further probe into the circumstances surrounding Jayalalithaa’s death, as part of Panneerselvam’s bid for justice? Will the AIADMK rally smoothly under Palanisamy and will he enjoy autonomy or be relegated to the role of a puppet under stronger Sasikala loyalists? It is unclear also whether the upcoming weeks have the potential to answer these and a host of other questions. However these answers without a doubt will importantly contribute toward answering the larger question of whether the AIADMK will continue to have a stronghold in Tamil Nadu. The dust is far from settling in Tamil Nadu. Tamil Nadu's J Jayalalithaa, an Indian Political Giant, Dead at 68Why Jayalalithaa Mattered For the Indian State of Tamil NaduWarming Up for the Polls in India: What's at Stake in Tamil Nadu's State ElectionsCan the BJP Win the Battle for Tamil Nadu?Are Tamil Nadu’s Dravidian Parties on a Terminal Decline?